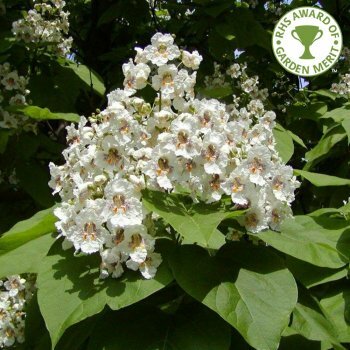 Catalpa bignonioides is a stunning award-winning deciduous tree, ideal to use in a lawn or wide border as a feature tree. The large, pale-green, heart-shaped leaves (up to 25cm across) are complimented by profuse quantities of showy panicles of orchid-type flowers in late summer. The fragrant flowers are mainly white with orange and purple markings on the throat and are followed by slender bean like pods (up to 40cm long) which can persist into winter. With a spreading shape, Catalpa bignonioides reaches an estimated height and spread of 6 x 5 metres in 20 years, although can be coppiced to grow as a multi stem. Known as an Indian Bean tree, it appreciate a sunny spot and well-drained, moist soil. Young trees need protection from frosts so a sheltered position is best and will prevent the wonderful large leaves being torn. Indian bean trees cope well with pollution so are great in city gardens - there's a row of mature trees, believed to have been planted in 1857, outside the Houses of Parliament. Our pot grown Indian Bean trees can be planted at any time of the year. Start by removing all weeds and grass within a metre of your intended planting hole. Dig a square hole as deep as your root mass and approximately 2x as wide. To help your tree establish more effectively, especially if you have poor soil, we advise sprinkling root grow in the hole. If you’re planting in spring, summer or dry weather, water well and regularly for the first few months. Make sure to keep an eye on young Indian Bean trees and increase watering if there are extended periods of hot or dry weather. If you’re planting in autumn, you may only need to water your tree a little. We stock a range of irrigation kits, suitable for a variety of planting schemes. Indian Bean trees do not require too much regular pruning. Removing any weak or wayward branches will help to tidy up the frame, whilst pruning lower branches will aid in raising the canopy. Although it is not necessary, Indian bean trees take well to hard pruning. If you wish to, you can hard prune in autumn to winter which will encourage fresh, fast growth in spring. This is great if you inherit an established catalpa tree that has not been well looked after.